Welcome to Webune Forums - We provide Excellent Web Hosting Services. After troubleshooting with the customer, we were able to resolve this problem (error message pop up). Explanation: after removing the () from the function, it worked. We dont know if this will help you, but if it did. good for you. but these are our notes so just incase anyone else sees this error in the future will know how to solve it and fix their code. when i get to a web page ,but the page i get an error. the first thing to try is turning off these messages in internet explorer: 1. open internet explorer 2. open the tools menu (alt and t) 3. select the internet options item (o key) 4. the internet options dialog has many tabs. you need the advanced tab. press control and tab until you get to the advanced tab (that's six presses for internet explorer 8) 5. you should now be in a list, starting with accessibility as the first item in internet explorer 8. this has the scripting options you want to change. 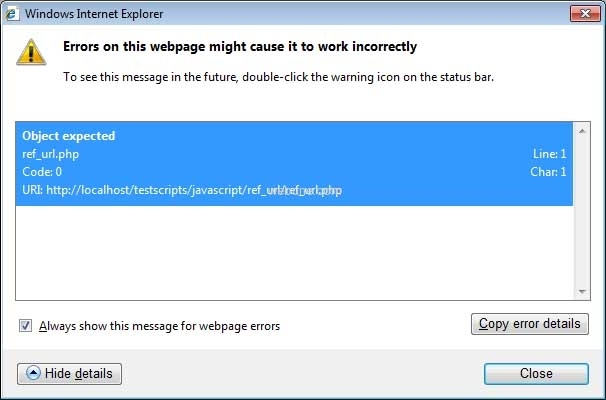 6. cursor down to "disable script debugging (internet explorer)" and press space until it is on. 7. cursor down to "disable script debugging (other)" and press space until it is on. 8. cursor down to "display a notification about every script error" and press space until it is off. 9. press the return key to close the internet options dialog. you should now have turned off the scripting errors.